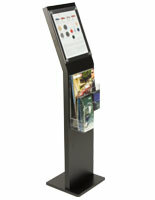 This brochure holder, literature stand is perfect for promotions, handouts, or catalogs. 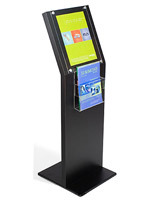 This literature stand is great for use in schools, retail environments, or business offices. 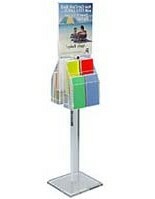 Each literature stand has an extra large, 2-tiered pocket. 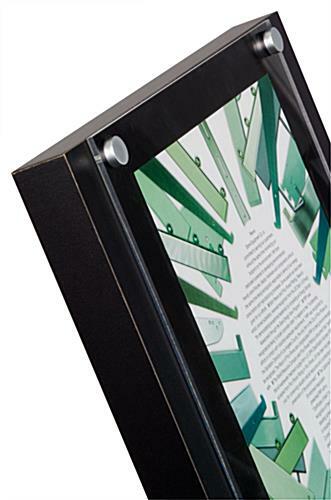 This acrylic pocket can be configured two different ways. 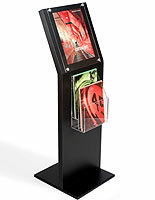 Three removable pins allow you to have (6) 4" brochure pockets, or two brochure pockets and two 8-1/2" x 11" literature pockets. 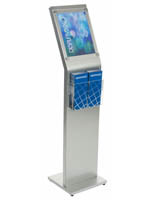 You are sure to attract the curiosity of people passing by with this attractive literature stand! 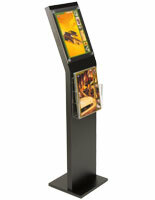 This literature stand is made of 1-1/2" thick MDF with a black laminate. 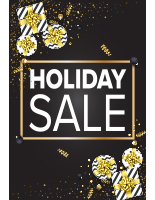 The literature stand has an 11"w x 14" h sign holder in the form of a thick acrylic faceplate. 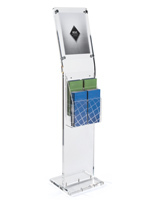 The faceplate secures your graphic by friction, thanks to the threaded satin silver caps holding the entire assembly together.This literature stand comes unassembled and takes minutes to put together.